Figure 1. 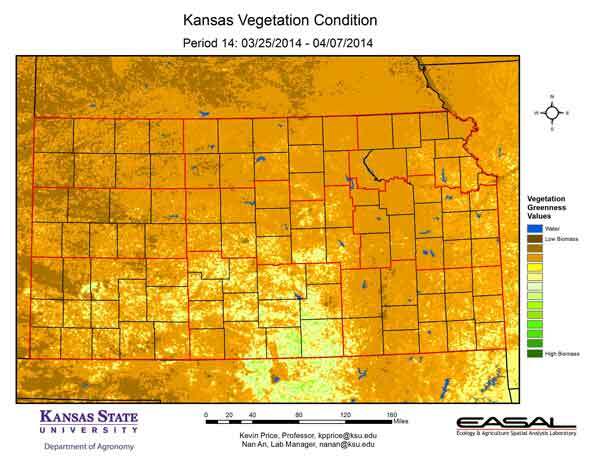 The Vegetation Condition Report for Kansas for March 25 – April 7 from K-State’s Ecology and Agriculture Spatial Analysis Laboratory shows that plant activity continues to be lowest in the Northwestern Division, where temperatures continue on the cool side. Greatest activity is in the South Central Division, where temperatures were warmer, although still below average for the period. Figure 2. 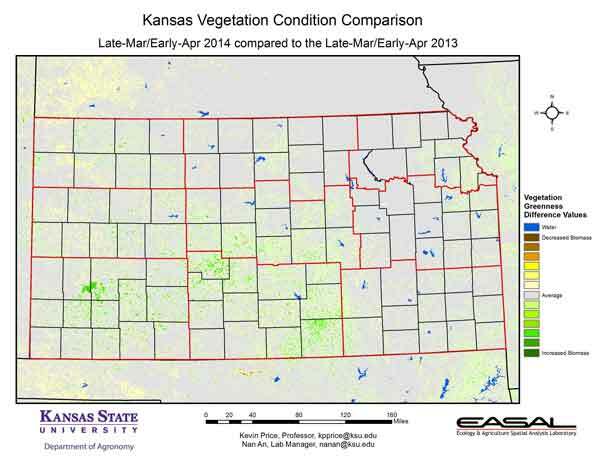 Compared to the previous year at this time for Kansas, the current Vegetation Condition Report for March 25 – April 7 from K-State’s Ecology and Agriculture Spatial Analysis Laboratory shows a very similar level of biomass activity. The biggest increase in activity is in parts of the Southwest and South Central Divisions, where temperatures are slightly warmer than last year. Figure 3. 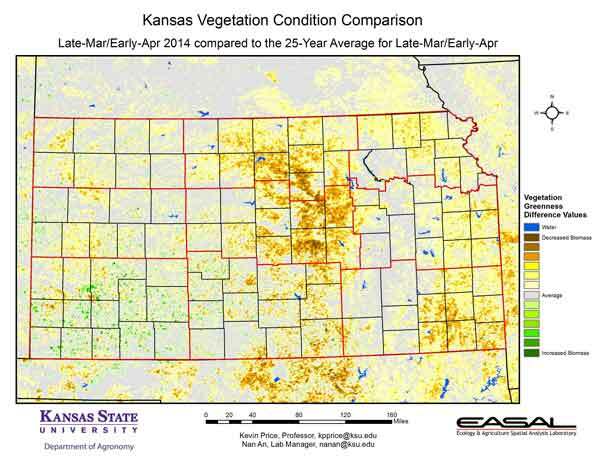 Compared to the 25-year average at this time for Kansas, this year’s Vegetation Condition Report for March 25 – April 7 from K-State’s Ecology and Agriculture Spatial Analysis Laboratory shows the biggest area of below-average activity is in the North Central and Central Divisions. Cooler-than-normal temperatures, lack of moisture in March, and some winterkill of wheat have combined to reduce vegetative activity in the region. Figure 4. 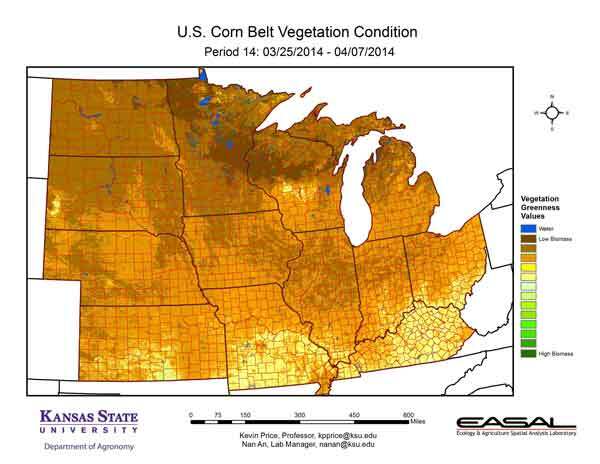 The Vegetation Condition Report for the Corn Belt for March 25 – April 7 from K-State’s Ecology and Agriculture Spatial Analysis Laboratory shows that vegetative production is beginning to develop in the southern portions of the region. Continued snow cover and cold temperatures have delayed photosynthetic activity in the Great Lakes portion of the Corn Belt. Figure 5. 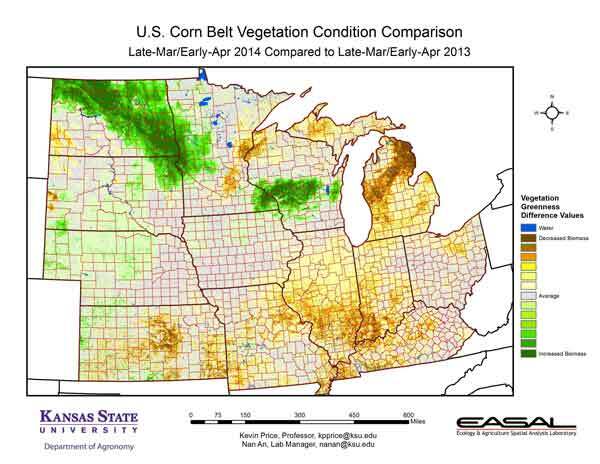 The comparison to last year in the Corn Belt for the period March 25 – April 7 from K-State’s Ecology and Agriculture Spatial Analysis Laboratory shows the biggest increase in biomass activity is in North Dakota and parts of Central Wisconsin. In contrast to last year, these areas have a relatively lower snow pack. Figure 6. 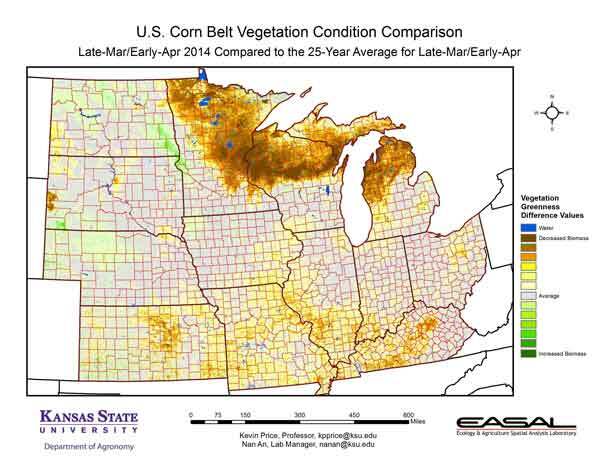 Compared to the 25-year average at this time for the Corn Belt, this year’s Vegetation Condition Report for March 25 – April 7 from K-State’s Ecology and Agriculture Spatial Analysis Laboratory shows that the northern Great Lakes region has the biggest delay in photosynthetic activity. Lingering winter conditions have delayed greenup in these areas. In parts of central Kansas, the lack of spring moisture combined with winterkill has had a negative impact on wheat that is emerging from dormancy. Figure 7. 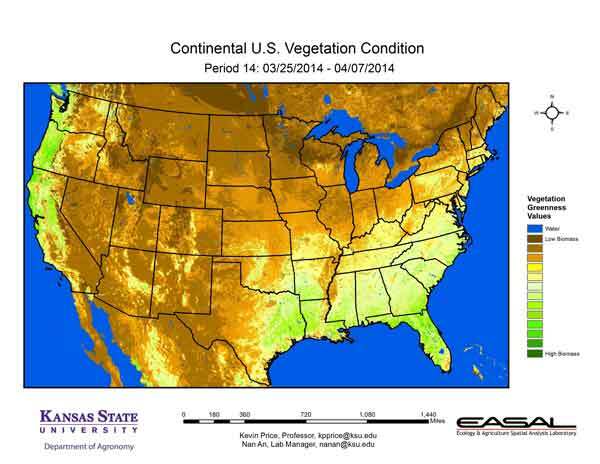 The Vegetation Condition Report for the U.S. for March 25 – April 7 from K-State’s Ecology and Agriculture Spatial Analysis Laboratory shows that the area of greatest photosynthetic activity is along the Pacific Northwest into central California and along the Gulf Coast from east Texas to Florida. In the Pacific Northwest, this activity, particularly in the mountains of California, are a concern as it signals very low snow pack and is likely to result in increased drought stress as we move into the summer. Figure 8. 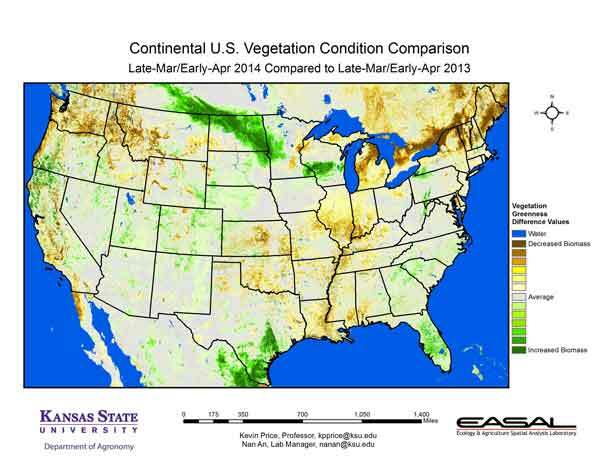 The U.S. comparison to last year at this time for the period March 25 – April 7 from K-State’s Ecology and Agriculture Spatial Analysis Laboratory shows that the greatest departure runs from the Northern Plains to Montana and Idaho. In the eastern part of this region, particularly in North Dakota, the lower snow cover has allowed for increased vegetative activity. Figure 9. 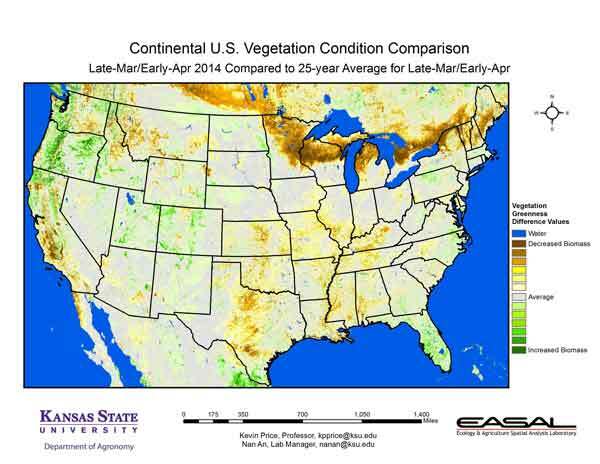 The U.S. comparison to the 25-year average for the period March 25 – April 7 from K-State’s Ecology and Agriculture Spatial Analysis Laboratory shows that the slowly retreating snow line has delayed plant activity in the Great Lakes region and, to a lesser degree, in parts of Montana and Idaho. From central Kansas to Texas and into parts of California drought conditions have reduced biomass production.